This product will be ready for shipping starting 2019-06-08. With energy and enthusiasm, the Enerzone team is once again innovating and living up to its reputation with the completely new Solution 1.7-I, which achieves incomparable performance of 1.26 g/h. This non-catalytic insert benefits from a state-of-the-art second combustion system. The first-class materials, the arched cast iron door with delicate curves, the positioning of the silver grooves, the high density refractory bricks, the standard silent fan are all assets that make this unit an easy-to-operate insert that has this little extra. It gives its owner unparalleled comfort, increased durability and superior reliability. 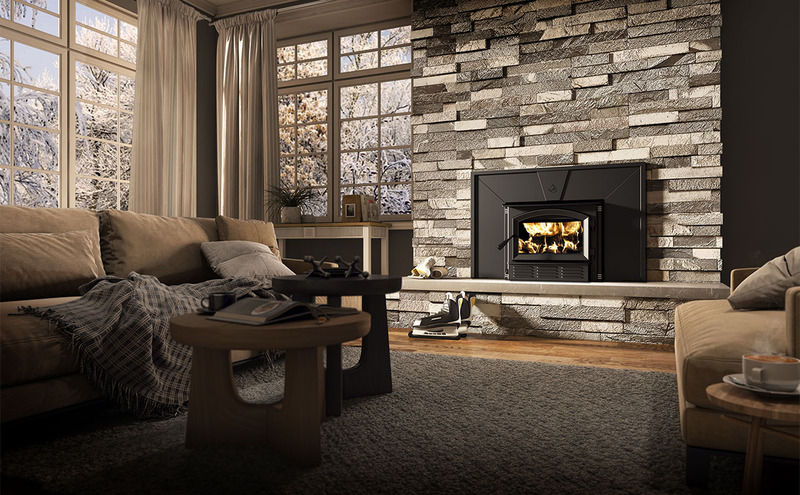 Always available as options, the regular or large faceplate, a choice of black or brushed nickel faceplate trims, the fresh air intake and the fire screen. Clearance – combustible side mantle to unit 9" 9"
Clearance – combustible top mantle to unit 27" 27"
Clearance – combustible side wall to unit 16" 16"
Clearance – top shelf to unit 27" 27"